Buy through MusicWeb from £14.80 postage paid. Two Liszt discs comprising identical programmes. 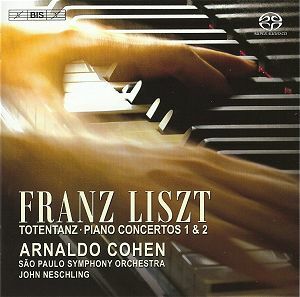 The first, on the BIS was recorded by established Lisztian soloist Arnaldo Cohen. 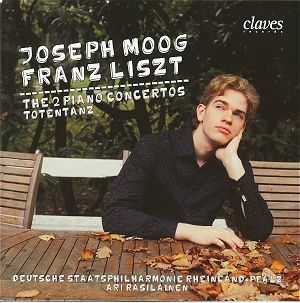 The second, from Claves was recorded by young pianist Joseph Moog who is making his recording début. These three scores, warhorses of the piano and orchestra repertoire, have proved to be popular choices in the recording studio and are generously represented in the record catalogues. With the two piano concertos and the Totentanz I have used for comparison purposes the 1987 Boston versions from Krystian Zimerman and the Boston Symphony Orchestra under Seiji Ozawa on Deutsche Grammophon, regarded by many as the finest available versions. Liszt’s most important works for piano and orchestra are the two officially known E flat Major and A major piano concertosAC and the Totentanz; all conceived during his virtuoso years. Influential music writer Edward DannreutherE expressed the view that these works "… would rank among the best concert pieces, were it not for the lack of weight and beauty in their main themes. As virtuoso pianoforte music these efforts are magnificent, the orchestration superb …"
Liszt made his first sketches for his E flat major Concerto in 1830, undertaking serious work in Rome around 1839-40. He seems to have completed it around 1849, making revisions in 1853 and more adjustments in 1856. It was dedicated to the piano virtuoso and composer Henry Litolff. It would be hard to imagine more eminent performers at its 1855 première at the Ducal Palace in Weimar, Germany than the composer as soloist and Hector Berlioz as conductor. Musicologist Jay RosenblattD described the concerto as, "Dionysian". Liszt biographer Humphrey SearleB wrote that it "is not an entirely successful work" believing the Concerto No.2 in A major to be, "very much more successful". However, this Concerto No.1 proved to be a more popular work in the recording studio. In this work Liszt provides unity within the sections of the score by employing several shared themes in ‘thematic transformation’. The inclusion of the triangle in the third section has been the cause of some ridicule by detractors over the years and influential Viennese critic Eduard Hanslick dubbed the score "The Triangle Concerto" a nickname now used with affection rather than sarcasm. In the opening movement Allegro maestoso Cohen’s playing does not sparkle and comes across as coolly efficient yet with an agitated character. The accompaniment from the São Paulo Symphony Orchestra under John Neschling feels a touch leaden. Moog in the opening movement provides robustly spirited and confident playing, communicating significant style and character. By comparison Zimerman radiates assurance and panache with underlying strength. His fingers sensitively float across the keys and the playing sparkles. In the Quasi adagio one is struck by Cohen’s feather-like playing combined with splendid orchestral playing. Moog’s performance is harder-edged, firm and expressive with a feeling that each note is crystal clear. The accompaniment from the Deutsche Staatsphilharmonie under Ari Rasilainen is outstanding. One immediately notices Zimerman’s tender and expressive playing, so achingly beautiful that it makes the piano glow with colour. His impressive interpretation in the contrasting central episode comes across cleverly like an aggressive tantrum. Ozawa’s Boston Symphony Orchestra provides Zimerman with superb support. In the third movement Allegretto vivace Cohen is rather unconvincing, displaying at times jerky and weighty playing compared to Moog who conveys a firm, crisp and assertive performance. Zimerman is in tremendous form with an assured touch, vigour and considerable style. In the fourth movement Allegretto marziale animato, with Cohen one is left wanting more urgency, although he executes the Presto, finale splendidly. The young Moog brings authority with an especially impressive lightness of touch between 1:00-1:21. I particularly enjoyed Moog’s splendid and exciting interpretation of the finale. There’s playing of grandeur from Zimerman and one especially notices a feather-light touch that just glides over the keys. This movement is remarkable and Zimerman brings the score home to an impressive climax. Liszt began composing his A major Concerto in 1839 in Rome, revising the score on at least two occasions in 1849 and in 1861. The first performance was given with Liszt conducting his pupil Hans Bronsart (von Schellendorff) as soloist at Weimar in 1857. To highlight the symphonic nature of the score it was named in the manuscript as a "concerto symphonique". The A major Concerto is designed in one single continuous movement, divided into six sections, connected by the use of ‘thematic transformation’. Jay RosenblattD described the character of the A major Concerto as "Apollonian". Humphrey SearleB described the score as, "remarkable" and that "the themes are far more interesting and capable of development" than its predecessor. Searle thought the transition into a march in the Finale was, "the one really weak passage [with] all the vulgarity of second-rate military band music". In the Adagio sostenuto assai - Allegro agitato assai Cohen is confident and expressive with Moog offering a dreamy opening that he develops with purpose and energy. Zimerman gives a masterly performance with equally splendid orchestral accompaniment from the Bostonians. One is aware of a real gracefulness in the calmer passages that contrasts with playing of power and control in the dramatic and stormy music. In the Allegro moderato Cohen provides calm and relaxed playing, fluid and controlled. The solo cello part is divinely performed. Moog’s interpretation is decisive and tender with a lovely cello solo. Zimerman offers beautiful playing combined with a powerful authority. He is supported by splendid orchestral accompaniment with an especially marvellously played cello part. In the Allegro deciso Cohen is robust and stately. He is exciting in the Marziale un poco meno allegro and calm and relaxed yet the music is delivered with purpose in the Un poco meno mosso. The impressive Moog provides a reading that is robust, muscular and dramatic. The changes of mood from Moog are most convincingly executed. It is hard to fault Zimerman who plays with a highly convincing authority throughout. In the Allegro animato section that closes the score Cohen is nimble and brisk with a finale to bring the house down. Moog provides vivacious playing that he skilfully develops into a spirited and highly dramatic conclusion. Zimerman’s reading of the concluding section is high voltage with a great sense of passion. The Totentanz (Dance of death or Danse macabre) was aptly described by Humphrey SearleB as, "a work of astonishing dramatic power." Evidently in 1838 Liszt was inspired by the magnificent frescoes titled ‘The Triumph of Death’ on the wall of the basilica in the Campo Santo at Pisa. In Liszt’s time the frescoes were attributed to Andrea Orcagna. Further inspiration came from a reminiscence of the Dance of Death at Basle by Holbein. As a result Liszt felt compelled to compose a score for piano and orchestra comprising a series of variations that embodied the ‘Dies Irae’ plainchant. Totentanz was first sketched out around 1839 and completed by 1849, undergoing subsequent revision. It seems that Liszt’s son-in-law, the pianist and conductor Hans von Bülow, was soloist at the première given at The Hague in 1865. In the Totentanz one is struck by the immediate sense of drama and foreboding that Cohen manages to communicate. In Variation IV Cohen provides a hymnal and reverential meditation. From 3:05 (track 5) a hunting tension just bursts onto the scene that continues into Variation V. Here from 0:39 (track 6) an extra injection of energy from Cohen ratchets up the level to one of thrilling drama. In Variation VI from 0:27 (track 8) the assured Cohen provides light and fluid playing. From 0:50-1:27 (track 8) Cohen is brisk and hectic in the zigeuner episode which serves to lighten the mood. In the Allegro animato Cohen and his Brazilian orchestra provide a heroic and splendidly satisfying conclusion. In the opening section to the Totentanz Moog’s playing has a sharp and almost violent edge, communicating a macabre quality. In Variation IV one is aware of the deep sacred nature of the music and in Variation V Moog ensures that the drama swirls around with a great sense of adventure. From 12:09 (tr. 9) Moog’s brisk playing does not attain the gypsy character as much as Cohen. The Allegro animato conclusion generally feels muscle-bound with rather choppy and weighty orchestral accompaniment. Zimerman projects a more thrilling and confident reading than both Cohen and Moog … and, it must be said, virtually all other interpreters. One notices Zimerman’s marked and highly effective use of dynamics throughout. In Variation IV the hymn-like episode from 4:03 (track 8) is deeply meditative. From 6:57 in Variation V and the following cadenza both Zimerman and the orchestra provide superb playing, packed with drama and excitement. From 12:01 in Variation VI the gypsy episode is highly enjoyable and from 12:37 Zimerman noticeably and expertly increases the intensity prior to the second cadenza. The demonic conclusion to the Totentanz is thrilling and dramatically performed. I felt like jumping to my feet and shouting bravo! With regard to alternative recordings of the two concertos and Totentanz, probably the most celebrated accounts and those most likely to be encountered are the exhilarating and confident performances from Krystian Zimerman and the Boston Symphony Orchestra under Seiji Ozawa. Zimerman recorded the scores at the Symphony Hall, Boston in 1987 with a warm and clear digital sound on Deutsche Grammophon 423 571-2. For versions of each individual score and specifically with this coupling I would not look elsewhere than this marvellously gratifying recording on Deutsche Grammophon; it provides an astonishing degree of excitement and satisfaction. There are many advocates for the excellently performed accounts of the two concertos from Sviatoslav Richter and the LSO under Kirill Kondrashin on Philips Classics Solo 446 200-2 c/w the Liszt Piano Sonata. The concertos were recorded by Richter in London in 1961 for Philips by the Mercury Living Presence team. The recordings have been remastered from the original three-track master tapes by the original Mercury producer, the legendary Wilma Cozart Fine. Not surprisingly when compared to many of the modern digital recordings the Richter analogue sonics, although acceptable, are not to the same standard as many of the more recent digital recordings. Sharing the same programme as the review discs are the performances from Jean-Yves Thibaudet with the Orchestre-Symphonique de Montréal under Charles Dutoit in Montreal in 1990 on Australian Decca Eloquence 442 8833. Sadly, despite some stylish and thoughtful playing Thibaudet cannot match the sheer scale of the dramatic contrasts provided by Zimerman. Worthy of much consideration is a highly attractive four disc set of Liszt ‘Works for Piano and Orchestra’ containing fine versions of the concertos and Totentanz performed Nelson Freire with the Dresdner Philharmonie under Michel Plasson. Freire provides character and presence in performances recorded in the Lukaskirche, Dresden in 1994 and originally released on the Berlin Classics label. I found the sonics of these digitally recorded accounts acceptable but not exceptional. The concertante works on this valuable set are performed by various soloists, orchestras and conductors on Brilliant Classics 99936 c/w Wanderer Fantasie, S.366; Fantasia on Hungarian Folk Tunes, S.123; Polonaise Brillante, S.367; Lelio Fantasy, S.120; Ruinen von Athen, S.389; Malédiction, S121; De profundis, S.691 and Piano Concerto No. 3 in E flat major, Op. posth. (reconstructed by J. Rosenblatt). A highly desirable recording of the First Concerto is the recently released 2006 Watford Colosseum recording from young Chinese soloist Yundi Li and the Philharmonia Orchestra under Andrew Davis. Yundi Li does a magnificent job with Liszt’s contrasting demands, displaying assured and exciting playing that blends drama with considerable poetry. It’s on Deutsche Grammophon 477 640-2 c/w Chopin Piano Concerto No.1. There are many supporters for the exciting and resolute 1968 Walthamstow Town Hall, London analogue account of the First Concerto from Martha Argerich with the London Symphony Orchestra under Claudio Abbado. I have the Argerich version as part of a two disc Franz Liszt compilation set on Deutsche Grammophon ‘Panorama’ 469 151-2. I still have fond memories of my 1982 vinyl recording of the Piano Concerto No.1 in the sparkling and stylish performance from French soloist Cécile Ousset with the CBSO under Simon Rattle on EMI ASD 4307 c/w Saint-Saëns Piano Concerto No.2. I understand that this Ousset recording, with the same coupling, has been released on compact disc on EMI CDC 7 47221 2 but as yet I have not tracked down a copy for my collection. Returning to the two discs under consideration: These are well played versions but the competition is extremely fierce and it is hard to look elsewhere than the distinguished Zimerman performances on DG. I am aware that the Cohen recording has received considerable acclaim in some quarters but despite a fine legato and without any fear of technical strain I was often left wanting more spontaneity and additional dynamic emphasis. The SACD from Cohen on BIS, played on my standard players, was warm, well-balanced and reasonably clear. The BIS booklet notes contain an interesting and informative essay from Jean-Pascal Vachon. The promising Moog is a powerful and fiery player whose emphasis on broad dynamic contrasts seem to permeate his interpretations. His musical lines are frequently boldly projected yet one senses that over time a growth in confidence and sensitivity will overshadow a certain tendency towards the impulsive. Moog on Claves is reasonably closely recorded with the sound a touch bright in the forte passages. I did not find the Claves booklet notes especially helpful or interesting.